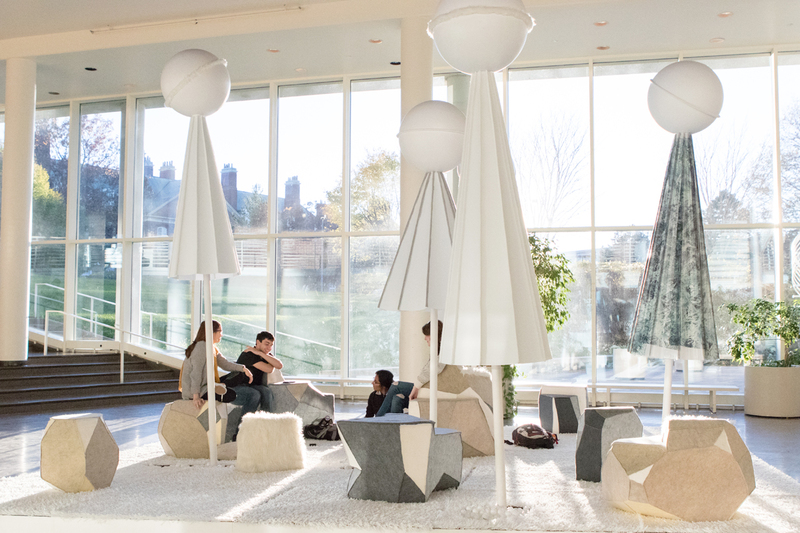 Students relax on a seating area in the atrium of Temple Buell Hall. The seating area was designed by art and design and architecture students for a design competition in Chicago. University of Illinois students designed a seating area for a major art and design show in Chicago last fall. Students in art and design and architecture participated for the first time in the SOFA CONNECT student design competition, part of the Sculptural Objects Functional Art and Design Fair in Chicago in early November. The U. of I. team was one of six finalists in the competition, but was not the winner. The finalists built their designs for installation at SOFA, which is open to the public and draws 35,000 visitors during the fair. “There’s no real area within SOFA to take a break or sit down. It’s all divided into gallery spaces. What students were charged with doing is creating a seating area for people to be able to sit down and relax,” said Katrine Trantham, the assistant dean for recruitment and admissions for the College of Fine and Applied Arts. Trantham is the college’s liaison with SOFA. The teams were given a footprint for the size of the area they had to work within and were told they needed to include a seating element and a lighting element. The U. of I. team’s design, “Oasis,” was inspired by Japanese dry gardens, or zen gardens. It includes large, moveable cushions for seating, and large lights inspired by weather balloons. The area also had gravel beds that could be raked and that, in Japanese gardens, imitate rippling water. The U. of I.’s team included students from art and design (most of whom are studying industrial design) and architecture. They came up with their design in the spring 2016 semester and submitted it to the competition. They learned last June that the team had been chosen as a finalist. A class was created for the fall semester to bring more students onto the team to help build the project. The students were encouraged to use recycled materials. They wanted to make the project as green as possible, but some environmentally friendly materials were more expensive. Trantham said the college would like to get sponsors to help with the cost of materials for future projects. “It’s a significant investment,” she said. But the opportunity to participate was both a learning experience for students and exposure for the U. of I. Many high school art programs bring students to SOFA, Trantham said.